The weather that greeted golfers Thursday morning may have been rather gloomy but the tournament was anything but! The sun soon came out and it turned into the perfect summer day as the Expect Miracles East Coast Classic entered its 18th year. 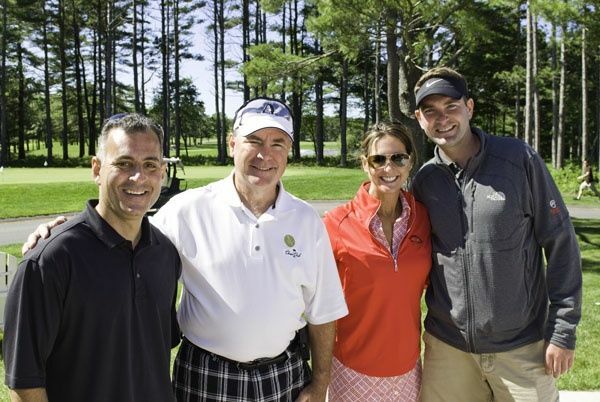 The Foundation welcomed over 360 golfers to Pinehills Golf Club and Waverly Oaks Golf Club on June 14th for this legendary charity golf outing. The 2012 East Coast Classic, with Foundation Sponsor Interactive Data Cooperation, was a great day for the financial community to join together to raise funds for cancer research and patient care programs. The Foundation was thrilled to fill three golf courses once again due to the tremendous support shown by the industry. The Foundation was elated to welcome two special guests at this year’s tournament. Kyle Lograsso is a 10 year-old cancer survivor diagnosed with cancer of the eyes. The disease took Kyle’s left eye but not his passion for the game he loves. Guests were blown away by the spirit and talent of this amazing kid as he showed off his skills on the course. Some lucky golfers even had the opportunity to play a hole with this special kid. Trick shot master Dan Boever entertained guests with his quick wit and amazing repertoire of trick shots. Dan is a World Long Drive Champion ranking among the most popular performers on the golf exhibition circuit. After finishing up on the course, the players headed to Pinehills Golf Club for a cocktail hour and awards reception. The helicopter put on quite a show, circling the driving range and dropping 500 golf balls onto the green with one lucky winner walking away with cash! John Dennis, WEEI radio host, was the event emcee and got the crowd energized for the Live Auction with fantastic items such as Bruins’ locker room access and a seat next to Andy Brickley in the broadcaster’s booth. You still have the opportunity to bid online for priceless courtside US Open tickets graciously donated by J.P. Morgan by clicking here. Frank Strauss, Founder & Chairman of the Expect Miracles Foundation, presented the evenings awards. Eileen Storz-Salino won the CJ Award for her generous spirit. The 2012 Expect Miracles Team was recognized for raising over $30,000 while running the Boston Marathon and the Gravity Financial Team was recognized for annually raising funds at the Run of the Charles Kayak Race. However, the best-dressed award went to 10 year-old Kyle Lograsso whose colorful suit matched his bright personality. In his public speaking debut (which can be viewed by clicking here), Kyle made a truly heartfelt speech about how we all have to do our part to help beat childhood cancer. The audience was then treated to a video highlighting the Expect Miracles Kids Golf Clinic and could see the impact this special event has on kids and families impacted by cancer. With the announcement that this year’s Kids Golf Day was being brought to historic Fenway Park in honor of the 100th anniversary, attendees were asked to help sponsor a child or family impacted by cancer to attend Kids Golf Day. With the generous support of our donors, we were able to raise over $11,000! We hope to make August 1st truly special for these inspirational families and are continuing to accept donations here. It is always a privilege to reconnect with the Expect Miracles family of donors and supporters at the Foundation’s cornerstone event. We are incredibly grateful for the dedication you have shown to the cause. We look forward to seeing many of you in CA for the West Coast Cocktail Reception on September 20th and West Coast Classic on September 21st. D. F. King & Co.,Inc.